The Lake turns two today. Two long years, trying to find my place as a researcher, journalist, media expert. Though it has been a long way, i’m still stuck in the same place. We all know what is going on, and i can’t argue with that. But i won’t complain, it’s no use. So i want to take this chance to thank you all who have been reading my posts, to all of those who have been sharing their knowledge and their views, to the ones who have supported me and my work in these last two years. You are the reason for all this. I’m restructuring my CV and online presence (again) so i’ll leave you with a few links: my resume, references to me and my blog, my best posts, my LinkedIn page, and also my quest for a sponsor for my MA in Online Journalism. And because it’s never too much, thanks again. O Lago faz dois anos hoje. Dois longos anos a tentar encontrar o meu lugar como investigador, jornalista, especialista de média. Apesar de ter sido um longo caminho, ainda estou no mesmo sítio. Todos sabemos o que se passa por aí e não posso questionar isso. Mas não vale a pena lamentar-me. Por isso quero aproveitar esta oportunidade para agradecer a todos os que têm lido os meus posts, a todos os que têm partilhado os seus conhecimentos e as suas visões, aos que me têm apoiado e ao meu trabalho nestes dois anos. Vocês são a razão para isto tudo. Estou a restruturar o meu CV e presença online (outra vez) por isso vou-vos deixar alguns links: o meu currículo, referências a mim ou ao blog, os meus melhores posts, a minha página no LinkedIn, e também a minha busca por patrocinador para o Mestrado em Jornalismo Online. E porque nunca é demais, obrigado outra vez. Twitter has a huge impact on how we express ourselves. Never mind the critics that accuse Twitterers of being shallow, narcissistic and obsessed with their food. Twitter is all about sharing the small moments that compose our lives, and Frank Kelly is trying to do a film with those shards of existence. Kelly is an independent filmmaker from Ireland, with two shorts in his resume. His latest project is built around Twitter: he’s asking 140 volunteers to shoot footage at the same time, showing what they’re doing at that precise moment. And how is he putting it all together? Via Twitter. I like the expedient nature of the website and how information, through concise messaging, can be communicated immediately to mass groups. It inspired the theme of connection. From there I began to build the structure around the idea taking the number 140 as a cue. The level of synchronicity and sharing in web communications has risen tremendously. Mindcasting and lifestreaming are concepts becoming more and more common everyday for users. I asked him where is this taking us. He said he wants to take us outside. I’m not sure. For me I want to take 140 further, I want it to become more than just a film but a life experience, so everyone involved can take it back into the community and use the experience to connect with other filmmakers, their environment and people around them. But he has some concerns. I worry that people will get swallowed up by their online existence, that’s why the essence of this project is to get back outside and experience and think about life, real life, and our connection to it, to our planet and each other. It’s not an environmental piece; it’s a piece about remembering who we are. I hope that’s what the internet will do, not to serve as a distraction from life but to be a tool to enhance life. Frank Kelly has been taking some advantages of social networking on the web, though he says it has no impact on a personal level. But professionally, it’s been rewarding. As an independent filmmaker who has no funding and is still trying to break into the film industry, the internet is an essential tool to continue to create work and connect with like minded people. It has allowed me to create a channel for my creativity. It has helped me greatly and indeed influenced me in a direction I never imagine I would go, or ever be able to go in – the idea that I could coordinate 140 filmmakers worldwide so quickly, and then synchronise them to film together would have been impossible for me to do 10 years ago. And they come from all over the world. By the time Frank answered to my questions he was just a few volunteers short of the required 140. I asked him if he felt the world was getting smaller, and if a smaller world means a better world. I don’t think the world is ‘getting smaller’, I think it’s bigger, there are more opportunities to travel, to connect, to see and do things we couldn’t have generations ago. When my parents were kids international travel was for the rich. Not now, anyone can go anywhere for very little. It has opened to world up to all of use, whereas before our world was smaller, it was our hometown, now it’s anywhere we want to be. In his point of view, it doesn’t really matter where his filmmakers come from. As humans we’re the same, we share experiences – we all feel pain and love and sadness etc. We want the same things: happiness, care, love, food, clothes and the same for our children, that has never changed and never will. We share those universal similarities. And technology, or the fact that we can communicate so quickly now, won’t change that. Perhaps the fear is that as we become more connected we become more the same and begin to lose our culture, our identity. I don’t think that’s going to happen and I don’t see that being able to share our individuality is a bad thing either. The internet has allowed us to experience more, share more, see more, be aware of more and celebrate our diversity. I think it has taken down many barriers that distance, geography, race, religion and culture have put up. It has allowed us to educate ourselves and understand more about our neighbours. At the end of the day we’re all human, we need to be connected and we need to share our existence on this planet. The 140 filmmakers will be connected and sharing next June 21st at 8pm GMT. Frank Kelly can be found at www.frankkelly.blogspot.com about his work as a filmmaker, frankasides.blogspot.com about other work and thoughts and eyethroughalens.blogspot.com as a photographer. He also has a podcast on iTunes via his company www.palestoneproductions.com. And, of course, he’s on Twitter. So what if you took away the money question. What questions would we be asking about local newspapers? Perhaps we’d be asking: What are they for? Who do they serve? What should they contain? Why do we produce them in the way we do? Perhaps its spending time answering these that gets us closer to answering “How do we make money?”. This struck me whilst watch Jane McGonigal’s Webstock presentation that asks “Why doesn’t the real world work like a game?”. The slide above particularly grabbed my attention. These are the main elements that make people happy, Jane says. 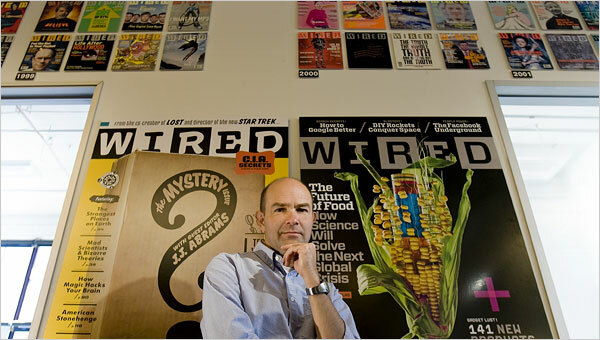 Chris Anderson, the editor in chief of Wired, believes in logic the way Tina Brown believes in buzz. He rarely approves a story idea unless the writer backs up the thesis with data. The basis of his best-selling book “The Long Tail” was a statistical phenomenon called the Pareto distribution; in his coming book, “Free,” he expresses arguments in profit-loss charts. The walls in his San Francisco office are whiteboards, covered with scrawled formulas. “Everything I do is expressed in equations,” he said, looking at his work. But Mr. Anderson has yet to solve the equation for Wired. Under his editorship, the magazine is an editorial success, winning three National Magazine Awards last month, which tied it for the most honored magazine. And Mr. Anderson’s own profile is higher than ever, thanks to his books, which roll messy business trends into neat canapés that executives pass around. He gives 50 speeches a year for an estimated $35,000 to $50,000 apiece. This beta service delivers tweets from thousands of media sources in North America and the UK, organized by topic or region. It is also fully searchable by content and journalist name to quickly identify key influencers and issues. In addition, a “Top Tweeters” link displays tweets from frequent tweeters at media outlets. When I decided to go into the news business, we took a vow of poverty, or at least acknowledged that we’d never be rich. I chose not to go to law school and instead transferred to j-school and did so in the full awareness that I’d never be well-paid. Wrong. I ended up being very well-paid because I worked in news in the last gasp of its century-longer monopoly bubble, which ironically came to a climax at the same time as the short-lived tech bubble. Before 2001, metro newspapers still made tens of millions of dollars in each of the classifieds categories, plus retail, plus circulation revenue. Magazines were still blockbuster businesses worth risking tens, even hundreds of millions of dollars to launch. TV will still a star medium where so-called talent was worth big money. Such was the sales pitch in 1965 for Aspen magazine, probably the world’s first example of what creator and former Ad Age editor Phyllis Johnson called a “multimedia magazine.” Each edition arrived at its subscribers’ homes in a small box, containing anything from a miniature sculpture to a brightly colored poster to a reel of celluloid film. In some ways, Aspen was a product of the 1960s, a time when art was drawing on popular culture and mechanical reproduction to spread its messages. In other ways, it was ahead of its time. There was nothing quite like Aspen, beyond very short-run art projects, for nearly 30 years. But today, at a particularly tough time for magazines, a number of publications are again looking beyond the standard glossy format, experimenting with different manifestations of what a magazine can be. In doing so, they are offering their readers special experiences that Web sites and other free-content digital distractions can’t match. I knew the day was coming, but it was still a shock when the day came. Groggy-eyed in the early morning light, I slowly went down the four flights of stairs in the front of my building and looked down. Nothing. For 18 generally uninterrupted years, I had the San Francisco Chronicle delivered to me, except when neighbors stole it. Today, there was nothing to steal. The prospect of a world without snooping reporters should be troubling even if you’re not the type who can say “Fourth Estate” with a straight face. Sure, reporters on lengthy investigative junkets produce their share of multi-part snoozers that wouldn’t see print if not for the sunk costs of the investigations— Pulitzer bait informing the reader, for example, that U-Haul trailers may flip if you turn your car too sharply. But the daily newspaper, specifically the daily newspaper with a full or near monopoly in its local market, can still afford to concentrate reporting resources with a degree of intelligence that blogs and news aggregators have not yet matched. The internet is, in a way, the first thing to deserve the label “media”. It is a general-purpose mediating layer, one that can hold multiple types of content, created and distributed for a variety of reasons and in a variety of ways. Prior to the internet, the costs of reproduction and distribution created an asymmetry of access: every time someone bought a radio or a television, the number of media consumers increased by one, but the number of producers didn’t budge. The internet, on the other hand, moves the basic mechanism of reproduction and distribution into a lattice of shared infrastructure, paid for by all and accessible to all. 2. You can shed a tear right now for the iconic ransom note, with letters clipped from newspaper headlines. What’s a kidnapper to do? Print out letters at home using different fonts and point sizes? 3. How are concerned neighbors supposed to figure out that the little old lady who lives alone is sick if the papers aren’t piling up on her doorstep? And how will burglars know which houses to target? Yesterday i recommended “Us Now”, “a documentary film project about the power of mass collaboration, government and the Internet“, which boomed across the web. It is a must see, but this post is not about the film. It’s about how they present it online, and how i feel it is a good model to be applied to major news reports and investigations. A transparency model. Imagine you’re a reporter after a major story, it involves loads of data, there are many different sides to the issue, and people to interview that have specific knowledge about it, be it technical, scientific, or just exclusive. Good journalists always delivered good stories on their own, and covered all the necessary angles to the subject. Working alone means full control of the process, from start to end, and a fair amount of discretion, secrecy, that often resulted in exclusives, the former bread and butter of good newspapers. But what if the process was public, and open to everyone? I’m not saying all of the process, but some parts of it. If a journalist is snooping around, asking questions about something, doors will close anyway, that will open with new information and the need to answer, retaliate, whatever – sometimes a statement comes out of conflicting views. But the saying goes “two heads are better than one”, and if we ask for users to help, many minds will work for the same purpose. The crowd could gather data, process it, provide input, suggest questions, and the journalist – besides having to do all the things he’s supposed to – would coordinate all of these contributions. This would improve the relationship between the users/readers and the journalist/story/brand. But if you are not a fan of full disclosure before publishing, why not do it afterwards? Release the videos rushes, the full audio, share the documentation and data you gathered in an open database. The advantages? Trust. Transparency goes a long way, and it prevents journalists from backing off from the story too early or to make mistakes. The liability risk is smaller, and if it is a controversial subject, it’s not the singled out figure of the journalist that is at stake, but a whole community behind the story. Of course, this does not minimize the journalists importance or responsibility, quite the opposite. “Us Now” producers made the footage available, transcriptions, download links for the full film, and i think this brings extra value to the work, instead of being commercially harmful. I like to see the bits and pieces that make things work, but if you don’t, just watch the finished version. There’s a good example of this in Wired’s piece about Charlie Kauffman, and i tried something similar for the pre-production phase of my interview with Dave Cohn. As a journalist, would you be looking forward this kind of openness? As a reader, would you participate? Ontem recomendei “Us Now”, “um documentário sobre o poder da colaboração em massa, governo e Internet“, que se espalhou rapidamente pela web. É imprescindível, mas este post não é sobre o filme. É sobre a forma como o apresentam online, e como acho que é um bom modelo a aplicar para grandes investigações jornalísticas. Um modelo de transparência. Imaginem que são um jornalista atrás de uma grande história, que envolve imensa informação, tem diferentes lados, e as pessoas a entrevistar têm conhecimentos específicos sobre o assunto, sejam eles técnicos, científicos ou exclusivos. Os bons jornalistas sempre fizeram boas reportagens sozinhos, e cobriram todos os ângulos que eram precisos cobrir. Trabalhar sozinho significa ter controlo total sobre o processo, do princípio ao fim, e uma certa dose de discrição, secretismo, que muitas vezes davam em exclusivos, o anterior ganha pão dos bons jornais. Mas e se o processo fosse público e aberto a todos? Eu não digo que seja todo o processo, mas algumas partes. Se um jornalista estiver a investigar, a fazer perguntas, algumas portas se hão-de fechar, e só se abrirão com nova informação e a necessidade de resposta, retaliação – por vezes uma declaração surge pela discórdia. Mas como o ditado diz que duas cabeças pensam melhor que uma, se pedirmos ajuda aos utilizadores, muitas irão trabalhar para o mesmo objectivo. O grupo podia recolher dados, processá-los, dar o seu input, sugerir questões, e o jornalista – para além de ter que fazer todas as coisas que tem que fazer – coordenaria todas estas contribuições. Isto melhoraria a relação entre os utilizadores/leitores e o jornalista /reportagem /marca. Mas se não são fãs deste tipo de abertura antes da publicação, porque não fazê-lo depois? Disponibilizem os brutos de vídeo, áudio, partilhem a documentação e os dados que recolheram numa base de dados aberta. As vantagens? Confiança. O peso da transparência é grande, e evita que os jornalistas se afastem da história cedo demais ou que façam erros. O risco é menor, e se for um assunto controverso não é a figura isolada do jornalista que está em causa, mas toda uma comunidade que está por trás. É claro que isto não minimiza a importância ou as suas responsabilidades, pelo contrário. Os produtores do “Us Now” disponibilizaram vídeos, transcrições, links para descarregar o filme inteiro, e acredito que isto traz um valor acrescentado ao trabalho, em vez de o prejudicar comercialmente. Eu gosto de ver as partes do conjunto, mas podem sempre ficar pela versão final. Há um bom exemplo disto com a peça sobre o Charlie Kauffman na Wired, e tentei fazer algo semelhante na pré-produção da minha entrevista ao Dave Cohn. Como jornalistas, estariam abertos a este modelo? E como leitores, participariam? A few weeks ago, Paul Bradshaw sent me an email asking if was interested in applying for the MA in Online Journalism he’ll be running from September, at Birmingham City University. Of course my immediate reaction was jumping off the chair and shout “F**k yes!”. If Paul is ahead of it it’s good enough for me – no doubts about quality. BCU’s MA in Online Journalism is one of the first of its kind in Europe, and is up to speed with the demands of modern journalism. So i am applying for sure – in fact, my pre-application is going today or tomorrow morning. But a few days later after that email, the “F**k no!” phase settled in. I’ve been asking and digging for grants, scholarships, fellowships, fundings, loans, and basically, i’m screwed. There aren’t any. I can´t afford anything like this, and it pisses me off that i might pass something like this just because of money. If the application board saying i’m not suitable to take the MA is something i can live with, but not the fact i’m not moneyed enough to pursue my goals and develop my knowledge and skills. You might think “Great, all the world needs is another post-graduate”, and in fact you’re right. Journalism’s industry and schools need cutting edge people to shape the way news must be gathered, processed, distributed. And this MA will, for sure, provide a few. I want to be a part of it. So, all need is the money. Since i don’t want to rely on crowdfunding like i did before (it’s a lot of money), i’m asking for your connections, contacts, whatever. I’m looking for a sponsor, it could be a company – two, three companies even – or other types of institutional support. In exchange i could work for my sponsors in the future and share what i’ve learned at the MA, instead of going to work for the competition. Or we can negotiate other kind of arrangement, i’m all ears. The bottom line is, i need to finance this without selling internal organs. As you can find out, i have a good reputation and capabilities that make me a good candidate for this. I believe this would be a great way to push my career forward and at the same time, be a part of the process of bringing Journalism into the Digital Age. I can answer to any questions you might have and i’m open to suggestions. Meanwhile, i won’t be sitting back waiting for a sponsor to fall from the sky. I’ll be probing a few people, and promote my cause. Now, i’m finishing my pre-application, and expect for the interview. Thanks in advance. Há uma semanas atrás o Paul Bradshaw enviou-me um email a perguntar se estava interessado em candidatar-me a um Mestrado em Jornalismo Online, que ele vai dirigir a partir de Setembro, na Birmingham City University. É claro que a minha reacção imediata foi saltar da cadeira e berrar “F***-se, sim!”. Se o Paul está à frente disto para mim chega – nada de dúvidas em relação à qualidade. O Mestrado em Jornalismo Online da BCU é um dos primeiros do seu género na Europa, e está a par das exigências do jornalismo moderno. Por isso de certeza que me candidato – aliás, a pré candidatura vai já hoje ou amanhã. Mas alguns dias depois desse email, instalou-se a fase “F***-se, não!”. Tenho andado a perguntar e à cata de bolsas, financiamentos, empréstimos, e, basicamente, estou lixado. Não há nada. Eu não posso pagar uma coisa destas e chateia-me que tenha que deixar passar uma oportunidade destas apenas por causa de dinheiro. Vivo melhor com uma candidatura recusada por falta de perfil, do que por não ter dinheiro suficiente para ir atrás dos meus objectivos e desenvolver as minhas capacidades e conhecimentos. Podem pensar “Boa, o que o mundo precisa é mesmo de mais um pós-graduado” e estão mesmo cheios de razão. A indústria e as escolas de Jornalismo precisam de pessoas de vanguarda para moldar a forma como se recolhe, processa e distribui informação. E deste mestrado vão sair uns poucos. Eu quero fazer parte disso. Por isso, o que eu preciso é de dinheiro. Como não quero depender de crowdfunding como fiz antes (é muito dinheiro), estou a pedir que usem os vossos conhecimentos e contactos. Estou à procura de um patrocinador, pode ser uma, duas ou três empresas, ou outros tipos de apoio institucional. Em troca podia trabalhar para eles no futuro partilhar o que aprendi no mestrado, em vez de ir para a concorrência. Ou podemos negociar outro tipo de acordo, sou todo ouvidos. O que eu quero é financiar isto sem ter que vender orgãos internos. Como poderão ver, tenho uma boa reputação e capacidades, que me fazem um bom candidato. Acredito que esta seria uma óptima maneira de avançar com a minha carreira e , ao mesmo tempo, fazer parte do processo de trazer o Jornalismo para a Era Digital. Estou disponível para esclarecer qualquer dúvida. Entretanto, não vou ficar à espera que caia um patrocínio do céu. Vou sondar algumas pessoas e promover a minha causa. Agora vou acabar a pré-candidatura e esperar pela entrevista.